In this guide we’ll help you troubleshoot and fix the Error Code 0xc0000225. You can encounter Error Code 0xc0000225 in Windows 10, 7 and other. It is really frustrating when you cannot boot your computer due to a certain problem. Unfortunately, if you receive Error Code 0xc0000225, then you are likely unable to even load to your OS. In the following article, we will attempt to help those of you, who are currently facing this same issue with their computer. The reason you are not even able to load your OS is because there is something wrong with the boot sequence – either in one of the assigned boot devices or in the MBR of the PC. Note that since several different components may be causing Error Code 0xc0000225, will provide you with several different options that you can try in order to have the error solved. Sometimes, faulty USB drives or external devices might be causing this problem. Therefore, the first thing you should try when attempting to fix this error is to disconnect all devices, such as printers, scanners, etc., leaving only the mouse and keyboard. Then, restart your computer and see if it loads normally. If it does, then the error is likely coming from an external device or a problem with one or more of your USB drives. Sometimes, certain programs might make changes to your OS settings that conflict with Windows, causing it to crash or be unable to load. Therefore, the first thing you should try in such cases is to boot into Safe Mode. That way, your system is much more stable and you can troubleshoot the problem without being interrupted. Here is a guide on how to enter Safe Mode. Once in Safe Mode, you will need to uninstall any recently acquired programs that might be causing the problem. Open Run by pressing the Windows key+R. In the search field, type appwiz.cpl and hit the Enter button. Sort the list of programs by date and look at the latest installs. If you think any of the programs that you have recently installed might be meddling with your system settings, thus resulting in the 0xc0000225 error, right-click on it and the select Uninstall. Next, use a Restore Point to bring your system settings to an earlier state where the 0xc0000225 error did not occur. This guide will show you how to use Restore Points. Restart the computer normally and see if it boots into Windows without receiving the error. If you cannot boot into Safe Mode or the previous suggestions did not work for you, you might need to manually rebuild your PC BCD (binary-coded decimal). Put your Windows installation disc in the disc drive or your bootable USB in any of the USB ports and restart the computer. Your PC should now boot from the bootable Disc/USB. Select the language, time and currency format and the input method and select Next. In the next window, select Repair your computer. Now, select the Troubleshoot option and go to Advanced Settings. Type the following command and hit Enter: bootrec /rebuildbcd. Wait until the operation is finished. When an installation is found, you will be asked whether you want to add it to boot list. Type Y and hit Enter again. Restart PC normally and see if the problem has been solved. Another cmd program that you can use if the previous fix did not resolve the issue is Diskpart. Boot from the windows installation disc or USB and get to the command prompt. Type the command diskpart (press the Enter button after each command). 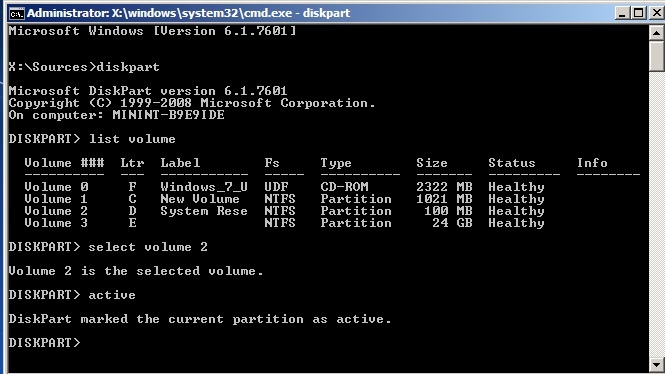 Take a look at the list of partitions. Now, type the command select volume + the number of the volume that is labeled as System Reserved. Next, type the command Active. Type exit to leave the Diskpart program. This is yet another fix using the command prompt after booting from the Windows installation disc or USB device. Once you get to the command line, repeat steps 1-4 from the previous fix method. Now, see what letter is assigned to your CD-ROM or USB drive that has the Windows disc in it. Type the exit command to exit the diskpart program. Now, that you know the letter of the partition with your Windows installation disc/USB, type its letter, for example E:. Hit Enter and then type cd boot and dir (Enter after each command). You should now receive a message that reads Bootcode was successfully updated on all targeted volumes. When you see that, type exit and press the Enter button to leave the program. Restart your PC and try to boot into Windows. In case none of the previously suggested fixes helped you resolve the 0xc0000225 error, you can try one of those three options. You will once again need a bootable Disc/USB to preform those methods. If you need a guide for that, here is a link to our Repair PC from bootable DVD/USB article. Can You Use Messenger Without a Facebook Account? - Yes, check our guide!